"The only way I imagined I might be able to make a better pancakes [than the frozen stuff] was if I beat egg whites until stiff and then folded them into the batter, but the problem with this method is that the only thing I hate more than baking is beating f*cking egg whites. I go through so much batter that I knew if I did this, I was just going to be beating those egg whites for the rest of my life. So I cut bait and started using the frozen stuff instead." This makes sense considering that 1.) Shopsin doesn't ef around doing things he doesn't like to do and 2.) for him, the pancake is all about equipment and technique anyway. He lays out his specifications for both in the subsequent section: The Art of Griddling. I know I mentioned this already in the mac 'n' cheese pancake post, but he goes into it with such conviction, I believe it deserves the double mention. There's much to take away from his notes on griddling, but what I believe is the most important is that the vast majority of us don't wait until the pan/griddle is hot enough. "Heat the griddle until a drop of water bounces off the surface. This is key," Shopsin writes. If you don't do this, to quote him yet again, but from another source: "different, bad things happen." 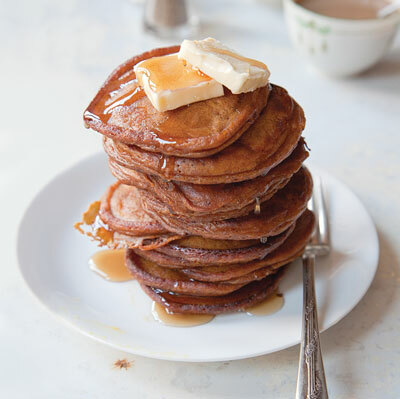 Thanks to his advice, with these pumpkin pancakes, similar, good things happened. I do wonder, though, if Shopsin makes his pumpkin pancakes from scratch or if he adjusts the Jemima batter accordingly. Either way, Matt and I enjoyed these and I think you will too. Maybe it's the fact that only last week, LA was experiencing 100+ degree weather, but I feel like I've never been more excited about fall and fall cooking. The clove and cinnamon coming off these pancakes as they cooked on the stovetop with my bare feet gripping the cold kitchen tiles and a chilly, autumnal breeze blowing in through the windows placed me firmly within a Ruth Reichl tweet. Far too dreamy for real life. I had been running around all day, but it was one of those moments where I had to stop and say aloud: "I love coooking!!" Here's a Bon Appetempt suggestion: Buy the ingredients for these pancakes (they all keep), wait for that perfect fall day to make them, then (and, this is key) turn up a few songs in the realm of, or specifically, Mumford & Sons' The Cave, and love life. 1. In a bowl, whisk together flour, sugar, cinnamon, baking powder, cloves, ginger, salt, and allspice. Add pumpkin, cream, milk, and eggs; whisk until smooth. 2. Heat 1 tbsp. oil in a 12" nonstick skillet over medium-high heat. Using a 1⁄4-cup measuring cup, pour batter into skillet to make three 3" pancakes. Cook until bubbles begin to form on the edges, 1–2 minutes. Flip and cook until done, 1–2 minutes more. Repeat with remaining oil and pancake batter. Serve pancakes hot with butter and syrup. This is something I seriously need to make! Thanks for sharing! I've had my eye on these for a long time, waiting until it was more seasonally appropriate. I think I've reached the time to pull the recipe back out. Glad to see you tagged it as a "success!" yum! they look beautiful. know what you mean about that fall weather and cooking! We need to make these again for Thanksgiving breakfast! Ou I've been meaning to make the mac & cheese pancakes since you introduced me to Kenny, but these look like heaven and will have to come first! Thanks for the Mumford & Sons link too! I use AJ complete powdered mix, making sure to start with room temp water and leaving many small lumps in the batter. I also use less water than what they suggest. For the big box - 8cups cold water + 5 cups warm water. Let the batter sit for a while. Load it into a squeezy container ( like a diner ketchup one) with the tip cut to make a larger opening. Put the amount you want in a small bowl and add plain canned pumpkin and Mara spice (my daughter's mix; I think it is cloves,ginger, cinnamon, nutmeg, allspice). Pour on a hot griddle, turn when the edges bubble. If your griddle is thin your only hope is to cook very small pancakes. All the rest of the instructions are not significant, but maintaining a constant, appropriate temperature is. Kenny: thank you!! that completely made my day. i have no true griddle--only pans, but my pancakes have been turning out better and better thanks to you and your book! Thank you for the insight Kenny! I'm going to attempt your pancakes tomorrow on this reversible griddle/grill! Now we have a new favorite breakfast for our favorite season. Matt, Thanksgiving is too far away to wait. oh my lord. this is beyond. dying. i need these. i don't care if it's one million degrees. give me the pumpkin. i'm going to try this. thank you!! if one truly hates pumpkin, this may not be the place to start... pumpkin cupcakes perhaps?! we made this this morning and they were a TOTAL HIT! We followed the recipe exactly and the batter was a bit too thick, but when we added more milk they were perfect. that's a LOT of ground cloves. i'd half that to start with and taste the batter at the end to decide if more goes in.